Who is on Moon. Alien or !!!! An irregularly shaped dark spot he noticed on Google Moon looks like it could be a cast shadow from a massive standing object, or figure. 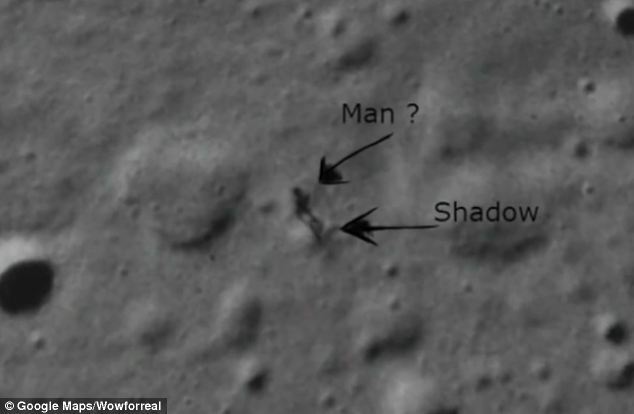 A viral video making the rounds on the Internet supposedly shows a humanoid figure walking along the surface of the moon.The strange shape can also be seen on Google Moon at 27°34’26.35″N 19°36’4.75″W. The YouTube video, from user Wowforreel, has been seen more than 2 million times in less than a month. Wowforreel said he started investigating the shadow after receiving an online tip from another web user named Jasenko. ‘It is really there, not faked and I have no clue what it is. I found nothing else like it in any of the other craters,” he added. The images used to create the lunar images for Google’s moon series come from NASA. There’s no word from NASA as to exactly what they believe the image to show. Of course, there has been plenty of speculation from many corners of the web as to what – or who — they think the shadowy figure is. August 13, 2014 in Science, technology. What happens to your body when you fast?